Now that summer is nearly over, I thought I would turn out one last summer themed post before I dive into all things pumpkin and and cozy. Since my skin is rather dry most of the year, shine control is only something I deal with in the summer. 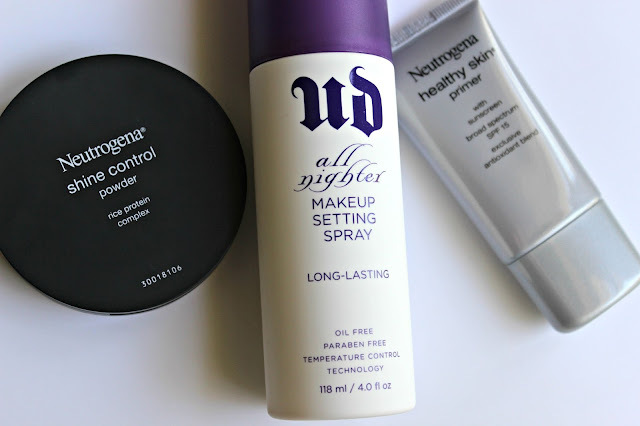 I got tired of my makeup slipping off in the heat and decided to try three products and I found the winning combination for all day makeup! I love this stuff! It not only helps set my makeup but it also makes my skin look well more like skin. I did a post on this a few weeks back if you want a more in depth review. This is a translucent setting powder that does a great job at setting my makeup. It is pretty finely milled for a drugstore powder so it looks natural on the skin. I wear this year round to set my makeup and I find that it looks great no matter what shade foundation I have underneath. This has SPF 15, which is great for year round sun protection. The texture is light and it kind of feels like a lotion. I tend to go for the creamy primers because I find they sit better on my skin than silicone based primers. All three of these products work great alone or together for a long lasting makeup look. What products do you use to keep you makeup lasting all day? Oil control is something I have to deal with all year round unfortunately! We are approaching Summer here is Aus so I might look at investing in the UD setting spray, I've heard nothing but great reviews!